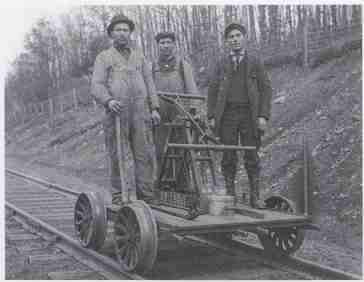 The romantic appeal of the handcar has made it one of the most endearing types of railway maintenance equipment. The average Joe on the street wouldn’t know a ballast regulator from a rotary plow, but he’d certainly recognize an old fashioned handcar. You know the kind you’ve seen them in old movies and morning cartoons. The handcar is little more than a basic platform with a pivoting beam to drive the wheels and takes two people to operate seesaw fashion. In these portrayals we often see two hapless characters propelling themselves along the tracks on such a contraption, without authorization or permission from a dispatcher or anyone else they zip into a tunnel, we hear the “toot” of a steam whistle or the “honk” of a diesel horn, and we see them again, pumping as fast as they can to stay ahead of a speeding express train. While this portrayal of the device is flawed, such machines were once quite common on American railroads. They were used by section gangs to travel along the track and move equipment. ---ABOVE: The Canadian firm of Woodings manufactured speeders in competition with Fairmont. Although relatively rare today, a few Woodings are still puttering about. 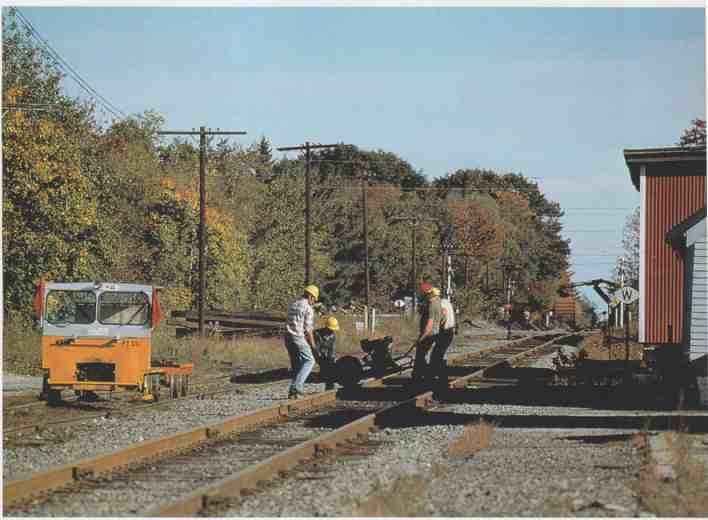 On October 2, 1997, a New Brunswick Southern crew inspects the former Canadian Pacific mainline at Matawaumkeg, Maine. ABOVE: Fairmont MT-19 speeder rides through pine forests on the Moscow, Camden & San Augustine. The most basic in rail transportation, Fairmont speeders were the vehicle of choice for track inspectors and maintenance crews for many years, though they are now relatively scarce. Though handcars were simple, inexpensive, and didn’t require much maintenance, they were labor-intensive to operate, limiting their usefulness. A variation of the handcar was the bicycle-like three-wheel velocipede. Also reliant on human power to make it go, the velocipede was comparatively lightweight. A renegade Michigan inventor named George S. Sheffield is credited with selling the first railroad velocipedes. As the story goes, in the late 1870s, Sheffield experimented with velocipede designs on the nearby Michigan Central. He did this without the railroad’s consent and eventually ran into difficulties with the company, which was displeased with the unauthorized use of its tracks. Despite these hurdles, Sheffield’s experimentation eventually led him to form the Sheffield Velocipede Company, which supplied rail velocipedes to the railroad industry. In 1893, the company made a technological leap and patented a two-cycle gasoline engine, which led to the development of a whole line of gasoline- powered rail motor cars. These early designs sparked a whole generation of motor cars produced by several different companies. Around the turn of the nineteenth century, the railroad equipment manufacturer Fairbanks- Morse acquired the Sheffield company and integrated its two lines of track cars. (Fairbanks-Morse is probably best remembered today for its foray into building diesel-electric locomotives in the 1940s and 1950s.) In the early part of the twentieth century, motorized track cars were listed in the Fairbanks-Morse catalog along with handcars and velocipedes, and the company pictured motorized track cars in its 1908 catalog. One advertisement read, Gasoline Motor Car, send for special descriptive circular,” and went on to list “hand and push cars, velocipedes, track-laying cars, gasoline engines, gasoline turntable motors,” among other items. Another entry depicts a slightly more detailed image of a motorized track car, with all the luxury of a tiny engine and three padded seat cushions for the comfort of the crew. The text be low the entry described the features of this gas- powered motor car. No. 2 Fairbanks-Morse Gasoline Motor Car, direct connected. For three persons. This car is identical with our No. i car, excepting as follows tool box is placed under front seat, also has extra guide arm and wheel for greater stiffness in running. All machinery parts interchangeable with No.1 car. Weight, ready for service, 385 lbs., packed for export, 700 lbs. The entry further explained that both the No. 1 and No. 2 motor cars were normally equipped with a mechanical sparking device,” or what we now call a sparkplug. These basic Fairbanks-Morse motor cars were primitive machines, as stingy with amenities as F-Ms ad copy was with articles and verbs! The velocipedes and handcars offered in the same Fairbanks-Morse catalog were equally Spar tan. The “No. I Velocipede Car” was little more than three thin-spoked flanged wheels, a pumping handle for propulsion, and a hard-backed seat. The car weighed just 150 pounds, but it was equipped with ball bearings! The “No. 2 Velocipede Car” shared most of the same qualities as the No. 1 car, except it had the addition of an auxiliary seat to carry a passenger and the ultimate luxury of a footrest for the driver. F-M was quite pleased with this model and exclaimed in the description, “It makes an excellent inspection car, as the inspector can sit facing the track and carefully note its condition as the car proceeds.” All these extra amenities on the No. 2 model weighed an additional 5 pounds. F-M’s handcars with the famous two-person walking-beam propulsion system were a bit more substantial than the velocipedes. There was the “No. 20 Standard Section Hand Car,” which weighed 555 pounds and had 3-inch-high side rails on the deck, presumably to keep tools from bouncing off as the car zipped along. The real queen of the rails, the big handcar, was the “No. 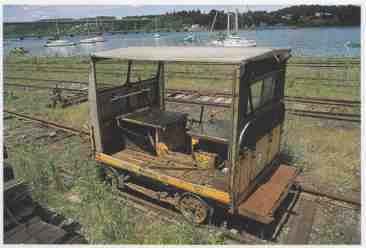 2 Special Hand Car.” Though short in the com fort department, it had lots of selling points superior to other models. Its platform was 7 feet, 6 inches long by 4 feet, 4.25 inches wide. As might be surmised by its narrow width, the wheels bracketed the outside of the frame. Narrow, frame benches were located on each side to serve as seats for passengers—the passengers being railroad crewmen on their way to a job site, not the paying kind found in the coaches and Pullman cars of a railroad’s fancy express trains. The standard wheels were made from 20-inch pressed steel, although a customer could order wood center wheels as an option. The walking beam was slightly longer on this car, making it easier to propel the car. The longer beam was certainly needed, because the car itself weighed 650 pounds and could carry about six passengers in addition to the pumping crewmen. Among the best-known manufacturers of rail motors cars was the Fairmont Gas Engine and Rail way Motor Car Company of Fairmont, Minnesota. Between 1911 and 1991, Fairmont produced an estimated 73,000 motor cars for use in North America and around the world. It had more than 18 different car models constructed for use on a variety of track widths, ranging from 2-foot gauge to 5-foot, 6-inch gauge. For much of the twentieth century, the Fairmont motor car, in one shape or another, was a standard fixture on most American railways. ABOVE: Fairmont’s MT motor cars were lightweight machines. Most MT models were equipped with air-cooled, two-cylinder, four-cycle Onan engines. Here Don Neale and Andrew Hudanish turn a Fairmont MT-4 motor car on the tracks at Moscow, Texas, on August 5, 2000. Early Fairmont motor cars used a small one- cylinder, two-cycle engine for propulsion. This simple internal combustion engine sounds much like that used on a lawn mower, making a “putt- putt-putt” sound. Unlike most heavy motorized cars in use today, many of the first cars did not have an adjustable transmission system to modulate the power of the engine, and instead used a direct drive, whereby the engine was permanently coupled to the drive axle. As a result, the machine had to be in motion when the engine was running; if it stopped, the engine stalled. To get the engine running again, the car had to be pushed along the tracks. To reverse the engine, a minor adjustment was made to the sparkplug (yes, just one plug for the one cylinder), and the engine was started in the opposite direction. A simple coil was used to produce the electrical charge needed to fire the sparkplug. Eventually a drive belt transmission was introduced, which offered a level of power output control. The drive belt typically was made from a heavy-duty industrial fabric. While a fabric might seem a tenuous choice for power transmission, a properly maintained belt could last up to 40,000 miles in regular service. 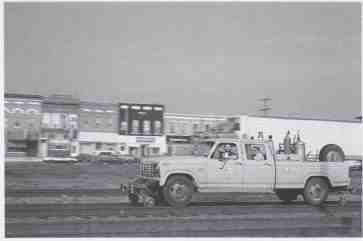 By the 1950s, Fairmont was building cars with more advanced engine and transmission de signs. Some cars came equipped with modern, powerful, two-cylinder, four-stroke engines, and featured mechanical transmission drive operated with a clutch. These more advanced motor cars had many advantages over the early models, but some railroads preferred the simplicity and low cost of the older two-cycle engine models, so Fairmont kept the older designs in production. 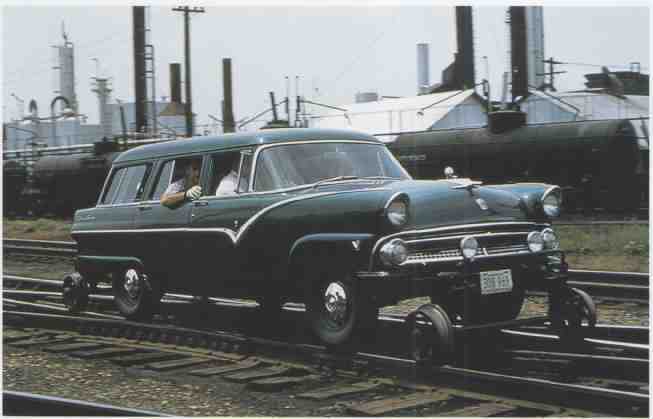 As with the early Fairbanks-Morse cars, the typical Fairmont cars had few frills and generally offered the most basic mechanized rail transportation possible. The simplest Fairmont motor car was little more than a motor, four wheels, and a simple platform. 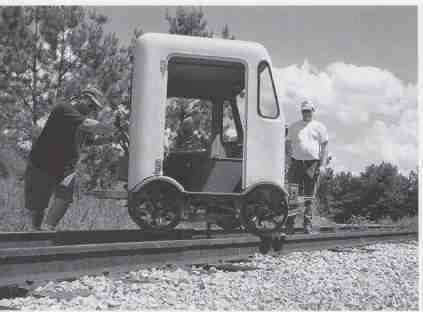 Accessories were available to improve the condition of different railcar models, and they varied from model to model. Some cars were very small, designed to carry just two people, while others were relatively large to carry six or more riders. The typical Fairmont was capable of speeds of 20 to 40 miles per hour on level track. Today, 40 miles per hour might not seem very fast, but when you are bouncing along on the hard seat of a mo tor car with neither seat belt nor any other protection between you and the great outdoors, and with the ties passing by—zip, zip, zip—just inches from your feet, even a mere 35 miles per hour seems like light speed. The cars were generally equipped with a fairly basic braking system, consisting of cast-iron brake shoes that were pressed against the wheels. Fairmont’s M-9 was one of its most basic models. It was an older style belt-driven car, in tended as a two-passenger inspection car. It could be ordered with either a one- or two-cylinder, two-cycle engine, which powered the rear axle. Like an old lawn mower, the engine was the traditional pull-start variety. The car had a very short wheelbase, and as a stock car, the M-9 did not come with a windshield, roof, outside protective covering, or even proper seat cushions. All these features could be purchased as extras at the discretion of the railroad. A slightly larger, heavier car was the M-14, which lacked a suspension sys tem and other amenities. The M-19 was a four- person model, slightly lighter than the M-14, and equipped with suspension. Fairmont’s MT model cars were similar to the M models, but most were equipped with a two- cylinder, four-cycle Onan engine that was air-cooled, rather than water-cooled. This engine used an opposed piston design—the pistons faced one another in a common cylinder—which produced between 18 and 22 horsepower. Perhaps the most important difference in the MT models, and the reason for the “T” in the designation, was their two-speed design. Most of these cars had a mechanical two-speed transmission operated with a dry clutch. The MT series cars could be equipped with enclosed aluminum cabs, heaters, and comfortable cushioned seats. With such lavish luxuries afforded on motor car crews, it must have baffled cynical railroad managers how such pampered men could get any real work done at all! Among the later Fairmont designs were the Model A motor cars, which came in various sizes and were equipped with larger engines than most motor cars. The A-8 model was the biggest of the bunch, powered with a six-cylinder engine, often a Ford 300-ci. Unlike most Fairmont motor cars, the A-8 had a long wheelbase and a solid suspension system that used both springs and shock absorbers to provide a comfortable ride. ---ABOVE: Dating back to the 1950s, Hyrail vehicles have largely superseded the traditional motor car or speeder. On July 24, 1958, a Ford Hyrailer rolls along the Illinois Central at Centralia, Illinois. Woodings was another common brand of motor car, and a few are still in use. These cars were manufactured in Canada and favored by Canadian lines. Woodings cars were normally enclosed and built with a suspension system. They were equipped with a mechanical transmission similar to that used in snowmobiles. Woodings cars were powered by a single-cylinder, four-stroke engine that produced between 16 and 18 horsepower. The use of traditional railcars for track maintenance and inspection greatly diminished over the years. Fifty years ago, motor cars were a common sight on all American railroads. They can still be found in regular use today, but motor cars are becoming increasingly rare. The motor car was advantageous for several reasons. It was a comparatively cheap and simple machine that was easy to maintain and operate. It was light weight and so could be loaded on and off the tracks quickly and easily, and it was easily stowed away. Railroads maintained railcar storage sheds along the right-of-way that faced the mainline, with stub-end tracks and groups of ties between the rails to facilitate the loading and unloading of railcars. Most railcars had re tractable wooden handles designed to pull the cars onto the tracks. Railcars were ideal for the rapid deployment of work crews and light equipment along the line, particularly in areas that were not easily accessed by highways. Since rail-cars ran close to the ground, they allowed inspectors a good look at the tracks. The lack of suspension and passenger comforts in the cars probably actually facilitated inspection and re pair of tough track. If a track inspector felt a big bump as he motored along, it was a pretty good sign that the track needed attention. The decline of the motor car speeder can be attributed to a number of factors. Since the end of World War II, American railroads have changed the ways they go about carrying out their track maintenance. The day of the traditional section gang is gone. Instead of localized gangs assigned to a specific section of track, rail roads use roving gangs that specialize in a particular facet of maintenance. Since specialized gangs have to travel greater distances, they have less need for speeders, and are often moved in buses, trucks, and work trains. With the introduction of modern maintenance machines and a smaller railroad network, far fewer people are required to maintain track. Prior to the advent of motorized cars and trucks and the development of a paved highway system, railroad maintenance was rail based in other words, maintenance crews relied on the railroad to maintain it. In most cases, this is no longer true. Highway access has been dramatically improved over the years, and today most railroad locations can be reached by rubber-tired vehicles on access roads. The conversion of many lines from double to single track facilitated the building of maintenance roads along the right-of-way. On the former New York Central Railroad and Pennsylvania Railroad mainlines, only two tracks remain where there once were four or more, providing ample space for a broad, well-surfaced access road along much of the routes. The development of Hyrail technology (described later in the section) also played a large role in the disappearance of traditional motor cars. 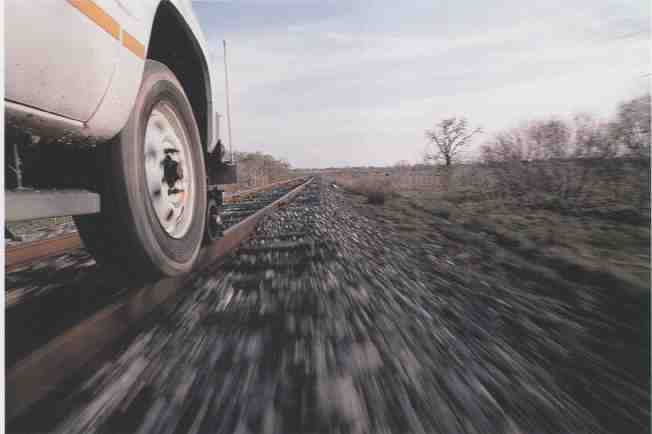 Using Hyrail wheel sets, most common cars and trucks can be fitted to operate on railroad tracks. Hyrail vehicles have a number of advantages over motor cars. They can get on and off tracks easily at most highway crossings, and they can travel on the road as easily as on the rails, making them much more flexible than motor cars. This flexibility makes them better suited to modern maintenance practices. A Hyrail truck also has all the comforts of a modern vehicle—proper suspension, ergonomic padded seats, heat and air conditioning, windshield wipers—little things that tend to make them a lot more agreeable to crews than the bouncy, open-air motor cars. In many situations where speeders might be called for, Hyrail trucks are used instead. Although largely superseded by modern Hyrail trucks, the traditional motorized speeder still has a place on some railroads. A Southern Pacific Fairmont speeder and trailer are seen at Truckee, California. Snow removal crews use speeders to carry equipment to difficult-to-reach places. Virtually no new speeders have been built for American railroads in the last decade, and most railroads have dispensed with speeder fleets in favor of Hyrail trucks and other transport methods. However, a few cars have been sold to lines overseas where more traditional maintenance methods still prevail, and even in this country, despite the major changes in the maintenance climate, the motor car speeder has not yet become totally extinct. Speeders have held on in few places, such as on remote sections of track, where highway access is severely restricted and where it may be difficult for Hyrail vehicles to get out of the way of trains. The two primary Sierra crossings in California have used speeder-based maintenance for this reason. Both the former Southern Pacific line over Donner Pass and the former Western Pacific route through the Feather River Canyon enjoy the colorful practice of speeder-car operation many years after other lines gave up on them. Like wise, Canadian Pacific lines serving remote areas favored speeders because of difficult access. 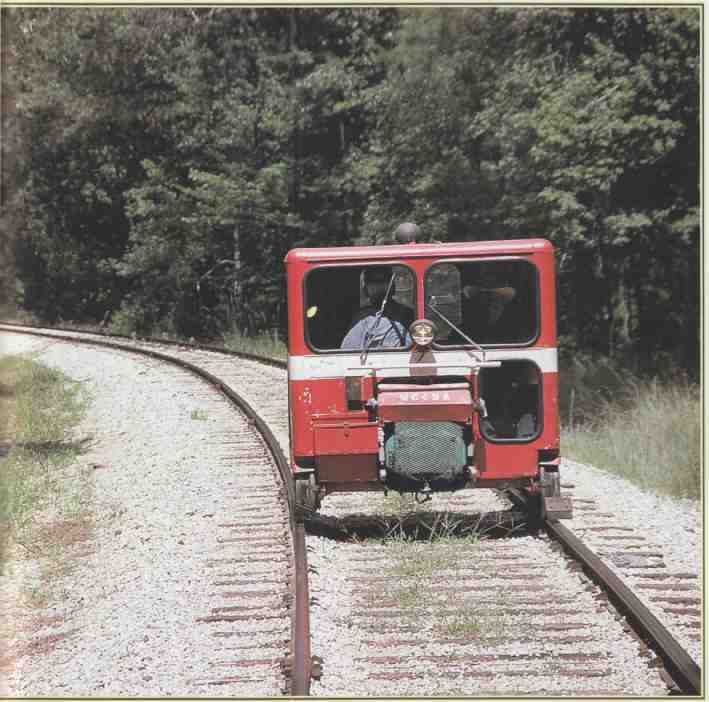 Although the number of active speeders has dramatically declined in the last few decades, they are one of the few types of railway maintenance equipment that have attracted serious interest from railroad hobbyists and preservation groups. Thousands of the traditional speeder cars are now privately owned. The romance of riding the rails in an open or semi-open car has great appeal to hobbyists. It’s like sleeping in the outdoors: when one is forced to do it, we call it survival” when one chooses to do it, we call it “camping.” The first is because one has no other choice, while the other is for pleasure. The simplicity of the speeders, combined with the quirky technology and the historical and romantic connotations, have great appeal in the modern world. In this way the speeder has come full circle. It was developed by an amateur for the pleasure of riding the rails, and in its retirement, it has again become the tool of amateur rail riders. This is not to say that speeder owners can just set down their historic Fairmonts or Woodings on the nearest set of tracks and speed away. This may sound like a tempting adventure to the novice enthusiast, but such activity would be more dangerous than skateboarding on the inter state at night—blindfolded! Speeder trips, whether initiated by the railroad for maintenance purposes or by enthusiasts wishing to travel over a stretch of tracks, must be approved by the rail road that owns and operates the tracks and coordinated with a dispatcher. Even a trip over very lightly used line must be properly coordinated to prevent accidents. Amateur speeder owners typically belong to an organization that arranges motor car trips over different railway lines, and ensures a level of safety among members through strict operating rules. The largest of these motor groups is the North American Railcar Operators Association ( NAR CO). Motor car excursions can involve dozens of speeders, and proper coordination of such events is essential. Excursions are scheduled in advance with the owning railroad, and usually the railroad will send a Hyrail truck with an official to pilot the excursionists over the line. Some excursions are relatively short trips, others traverse hundreds of miles and can last for days. The Hyrail truck does now what the motor car once did. It is basically just a normal over-the- road type of truck that has been equipped with pi lot wheels to guide it along the tracks. While the modern Hyrail vehicle has become popular only in the last few decades, rail-equipped automobiles have been around since the early days of the private car. These early automobiles on steel wheels generally served as inspection vehicles. Unlike the modern Hyrail truck, they did not have the flexibility to get on and off the rails easily. The Hyrail’s function and ability has moved well beyond the basic pickup truck on the rails. Today, Hyrail technology has permitted a large variety of different vehicles to be equipped with adjustable steel wheels for operation both on the rails and on the highway. Boom trucks, welding trucks, payloaders, and cranes are all now routinely fitted with some variety of Hyrail wheels. ABOVE: A Fairmont speeder at Belfast & Moosehead Lake’s yards in Belfast, Maine. 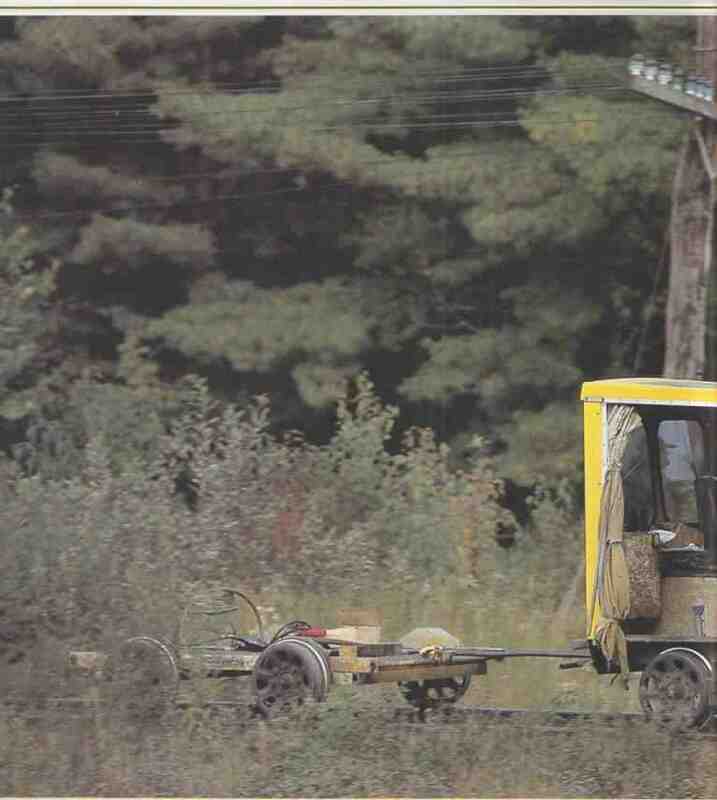 Speeders survive on many shortline railroads and are popular with hobbyists. The type of Hyrail wheels employed largely depends on the size of the vehicle and the weight of its intended load. Hyrail wheel attachments have several basic requirements. They are, of course, flanged to keep the vehicle on the tracks, yet they need to be fully retractable so they do not interfere with the vehicle while driving on the highway. 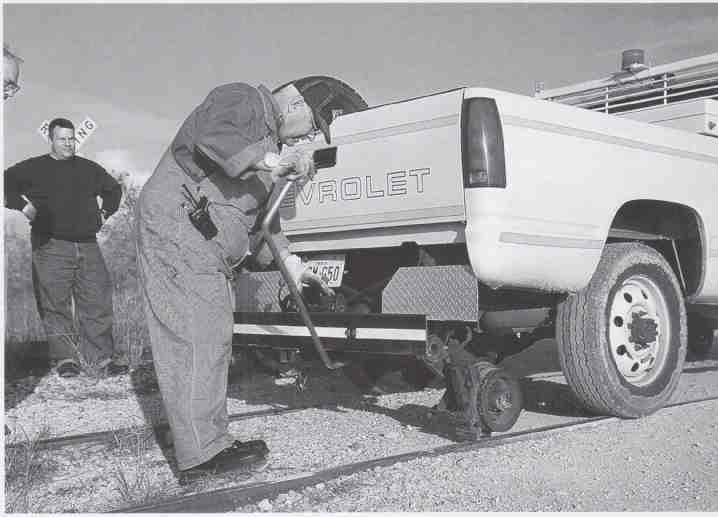 The wheels need to provide sufficient support for the vehicle when operating on the tracks, but they should not weigh more than necessary, since additional weight reduces fuel efficiency and limits the vehicle’s load-hauling capacity. When a vehicle is running on the rails with Hyrail wheels, it is still propelled by its conventional rubber tires. A suspension system is necessary to avoid rough riding on the rails, while at the same time maintaining adequate adhesion for propulsion. A steering wheel lock is provided to keep the wheels straight when in rail mode. Lastly, Hyrail wheels must easily deploy and retract to allow the vehicle to get on and off the tracks quickly and easily. ABOVE: Modern railroads use Hyrail trucks for a great many purposes. A Burlington Northern Hyrail driver gives a friendly wave on a clear September 1989 morning at Mendota, Illinois. ABOVE: One of the advantages of a Hyrail truck is that it can be easily set on and off the tracks at level highway crossings. Earle Leeson manually lowers the flanged guide wheels on a Hyrail truck at Harwood, Texas, on December 9, 2000. Hyrail wheels for small trucks can be made from aluminum or steel, and a mechanical system may be used to raise and lower the guide wheels. For example, Harsco’s HR0307 Series A HY-RAIL guide wheels, designed for trucks with a load capacity of 700 pounds, use aluminum wheels and frames. The front and rear wheel sets weigh 255 pounds each, not including the nominal weight of the mounting equipment. The wheels themselves are set 4 feet, 8.5 inches apart (the standard American track gauge), and they are just 10 inches in diameter, with a flange diameter of 12.25 inches; they are much smaller than conventional wheels on locomotive and freight car designs. The wheels may be ordered with either a steel or rubber tread. Since these wheel sets are relatively lightweight, they are applied using a simple mechanical system, called an Easy-Lift actuator. For larger trucks running on the tracks, Harsco offers more substantial HY-RAIL pack ages. This means heavier equipment, more substantial wheels and suspension, and hydraulic controls to raise and lower the guide wheels. The use of a “support carriage” transfers the vehicle’s load from the rubber tire wheels to the steel guiding wheels for better suspension. For a Hyrail truck to get on the tracks, it must be properly positioned at a grade crossing. The truck should be turned to line up with the tracks in the direction of travel, and the guide wheels lowered and locked into place. The steering column must be locked, and then the truck is ready to proceed down the track. Most American mainlines are inspected daily by a track foreman or other official driving a Hyrail truck, and it is quite common to see a railroad pickup cruising along on the tracks. Usually the passing of a Hyrail truck means there isn’t much rail traffic in the area, as a dispatcher will only give a Hyrail truck permission to occupy the tracks after all trains are out of the way. 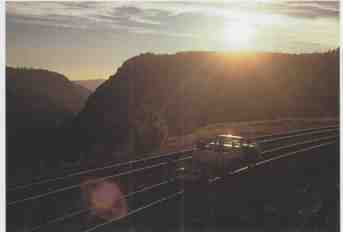 ABOVE: Hyrailing along the Texas, Gonzales & Northern mainline at speed. The beauty of a Hyrail truck is that it uses its rubber-tired wheels for propulsion while metal guide wheels keep the vehicle on track. The steering column is locked in place to preclude any difficulties. There was a shocked silence. After a bit, I assume, the track- car driver got where he was going, however humbled by his mistake. Not all track-car drivers are so lucky. A few years later, fellow photographer and author Brian Jennison and I were photographing along Southern Pacific’s “Cal P’” (California Pacific) mainline in the vicinity of Martinez, California. It was a thick foggy spring day, and we were looking for a suitable place to make a set of Amtrak No. 6, the eastbound California Zephyr. We considered going across the Carquinez Straits to a location known as Bahia, but decided against it on account of the fog. Instead, we set up for a shot on a bluff overlooking the straits near SP’s Ozol Yard on the west side of Martinez. Amtrak No. 6 rolled passed, and we made our photographs. Then, about 10 minutes later, the engineer called the dispatcher over the train radio. I learned later that the driver of the Hyrail died on the spot. A year or so after the incident I was back at the grade crossing at Bahia, and noticed that a wreath of flowers had been hung on the meter maid there. (A “meter maid” is a track-occupancy indicator, consisting of a small semaphore sealed behind glass.) I’ll always wonder, if we had decided to take our pictures at Bahia, instead of Ozol, could we have warned the Hyrail driver? ABOVE: As the sun sets over the American River Gorge, a track inspector takes a closer look at a potential defect at Old Gorge on the west slope of California’s Donner Pass on December 15, 1989. While riding the rails in a Hyrail provides some spectacular views, these trucks have to share the tracks with larger and much heavier trains.